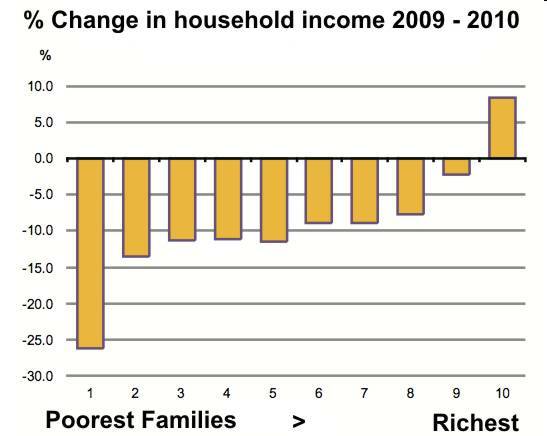 What you are looking at above is an ESRI chart of household disposable income, charted over 2009 to 2010. 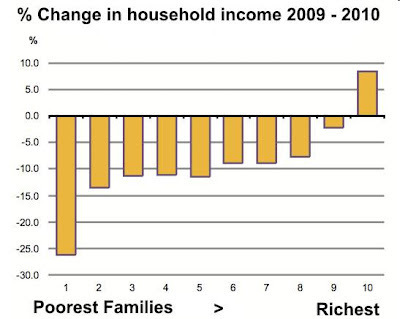 The poorest families are the ones on the left - and richest families are to the right. What do you see??? 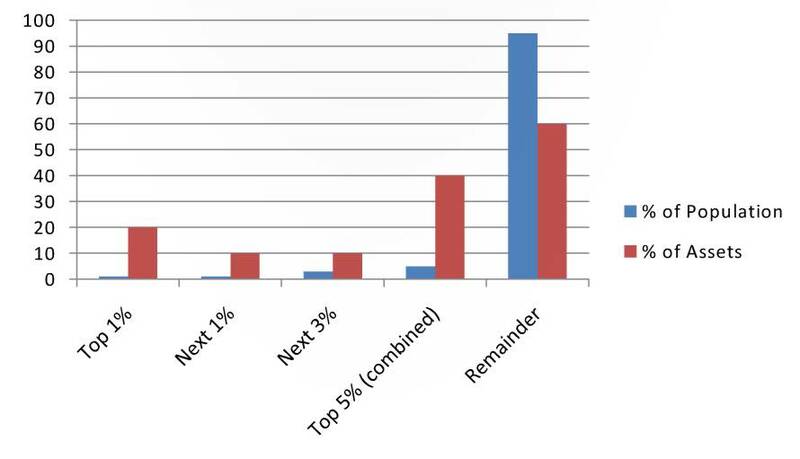 The RICHEST are almost 10% better off during the recession despite all the cuts etc. - while the poorest are more than 25% worse off. What does this mean?? It means - Hard Times - THE RICH GET RICHER and the poor get much - much - much poorer. Am I ranting - you betcha I'm ranting!! My blood pressure goes up every time I think about this. Now consider the hated, the ill conceived, the ham-fisted Household Charge and why it is so massively inequitable, so unjust and so imbalanced. The ESRI Research Institute chart above says it loud and clear - the situation is VERY bad. "Ah - so it's a bit bad alright there lads - so why don't we make it worse by placing an indiscriminate, across the board household tax or poll tax on everyone - same for those with millions as for those with nothing but debts. The rich will hardly notice it happened, while the poorest - well, it will take food from their mouths, heat from their homes, and send them further into despair. But - sure - you would never know - the people might not notice, or they might even fall for it!!" IMHO The Household Charge or Poll Tax has been one of the poorest and most ill considered pieces of legislation ever made in Ireland, it could even bring down the government. If there was fairness and balance in the household charge, the top of the rich household pile would pay perhaps €50,000 each while the poorest would not be asked to contribute at all. Fairness - Balance - Equity - no sign of it in Ireland, where members of parliament and of the judiciary can get away with claiming €50,000 a year in expenses on top of their over-generous salaries. Should the Irish Government be Listening? Q: Why do revolutions happen? Inequity - yes - but also a deafness of rulers to the voices of the people. Good examples currently playing out in the Arab world right now. The figures are screaming out INEQUITY. Ireland 5% of the population own 40% of everything. Maybe not as bad as Russia before the revolution - but BAD enough. What is really worthy of careful attention is how the perception of the Irish population has changed significantly as the recession deepens. In 2008 - 26% of Irish people felt that wealth distribution was QUITE FAIR - That figure had fallen to just 11% in 2010, and I am prepared to bet that it will fall even further in the next couple of years. I hope for stability sake that the Irish Government is listening carefully to the groaning of the people!!! mmm, well the household charge as they call it, I have seen a few arguments about this, and all or mostly all are negative. One that concerns me is the peopl that paid are now registered to pay again. The once that have not paid might just get away with this, therfore the once that paid are being penalized for ever. Next year we will get a property tax, water charges and if you are unfortunate enough septic tank charges. first Property tax, I thought we were free from Europe, this is not the case this is european legislation apperently wich could run up to substantial summs the € 100 is nothing to this. Water - I personally have no issue paying for water however, first million if not billions are going to be paid for the installation of water meters. The water quality is not great, brown water, loads of lime stone, little red worm in them or swimming pool water comes out of the tap, never mind the grit sometimes! House should be charged as how many are living in the house, set figure per person, and maybe the size of the house, no waer meters and this will safe millions! Septic tank tax - Well we were allowed to build our houses, this had been approved by the Counsil, however the council could not provide connection to the mains therfore a septic tank was being approved at substantial cost, this is not maintenance free either therefore septic tank owners are already spending more than there fair share. Maybe what should be done for a nominal fee there shoudl be inspections on septic tank if they are older than say twenty years?? The other thing is every one is up in arm about the household charge, however the thing that cost way more is the VAT hike, this can cost any household over € 2000.-- per year, at the moment there is soooo much hullaballoo for the house hold tax the VAT increase is being forgotten.